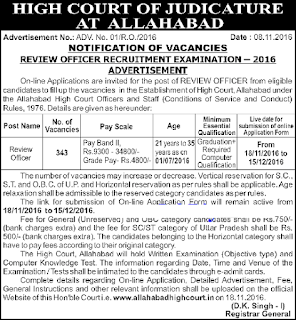 Allahabad High Court has published recruitment notification 2016 for 66 assistant review officer posts. 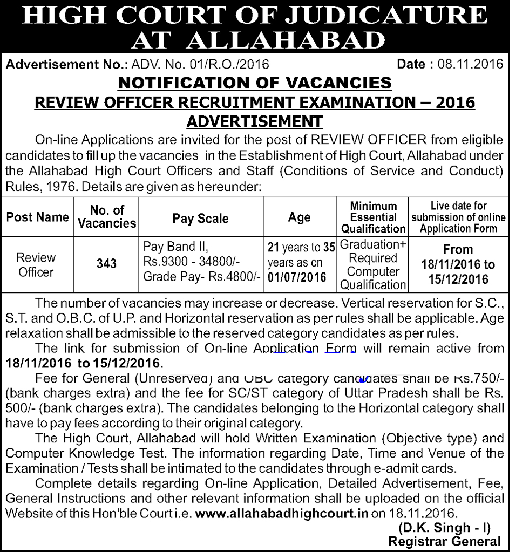 All legible and interested candidates have to apply on or before (02-12-2016). Further more information about given posts is mentioned in detailed below. Number of vacancies - 66. Salary and Grade pay - The salary will be Rs 9,300 - 34,800 with Rs 4,600 grade pay. Age Limit - A candidate age should be 21 - 35 years. To know more about age details as post wise, click on detailed advertisement. Educational Qualifications for given posts - To apply for the mentioned posts, candidate should must have done 10th, 12th, graduation degree or its equivalent/ relevant qualification from a recognized board or university. Selection Method - A candidate will be selected on the basis of their performance in written test and computer knowledge test. How to Apply - All legible and interested candidates can apply online through given link below. Application Fee - Rs 750 for General / OBC candidates and Rs 500 for SC / ST candidates. Last Date - A candidate should must apply for the posts on or before (02-12-2016). Important Note -Application forms received after due date will not be entertained under any circumstances.